C. A. Ferguson, Ed.D. is self-publishing her first book with Outskirts Press, and she wants your help deciding on her book cover. In Emerson’s recurring dream, she is helpless and terrified, watching the spaceship spin out of control and hurtle to Earth. She breathlessly observes the young alien woman, and from the depths of her own psyche, she feels certain that she is this alien, that she is experiencing one of her own past lives, and she is reliving her own death. 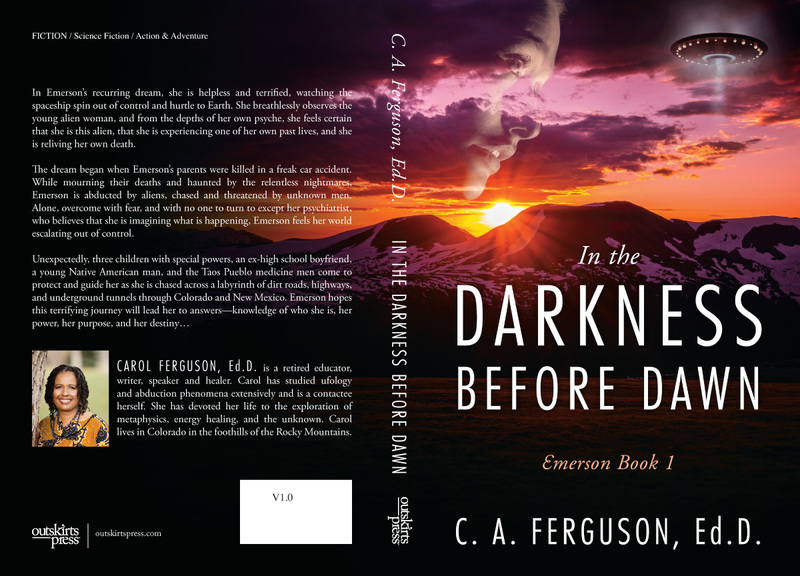 The dream began when Emerson’s parents were killed in a freak car accident. 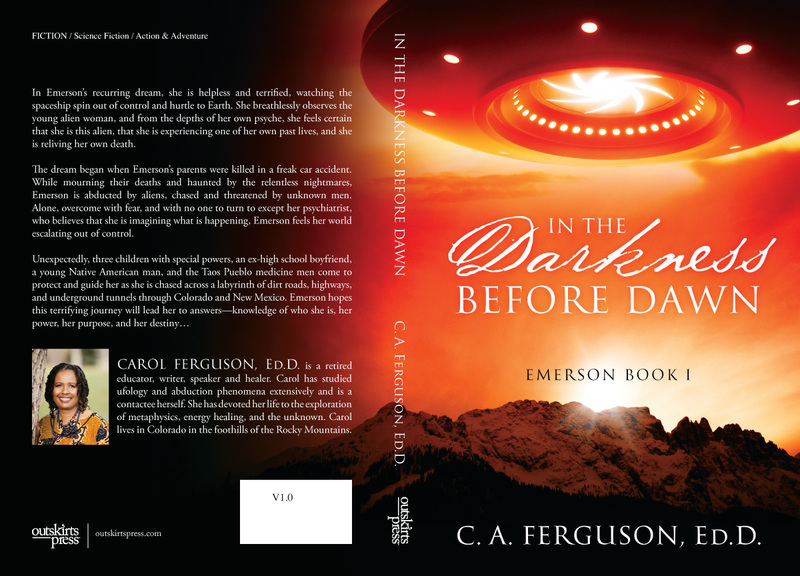 While mourning their deaths and haunted by the relentless nightmares, Emerson is abducted by aliens, chased and threatened by unknown men. Alone, overcome with fear, and with no one to turn to except her psychiatrist, who believes that she is imagining what is happening, Emerson feels her world escalating out of control. Carol Ferguson, Ed.D. is a retired educator, writer, speaker and healer. Carol has studied ufology and abduction phenomena extensively and is a contactee herself. She has devoted her life to the exploration of metaphysics, energy healing, and the unknown. Carol lives in Colorado in the foothills of the Rocky Mountains. Please take a look at two possible covers below and then vote on the choice you recommend for Carol. Definitely Option B is the best book cover. It stands out more and draws me in. It sums up what the book is about in the picture alone and wants me to read the book to see what happens. It is definitely a more exciting book cover! Option A does not measure up. It lacks what Option B emits! Hi Shirley! Thank you for your feedback!